Not many designers can say that they have been doing freelancing for 7 years, before the freelance boom in the last 3 years. 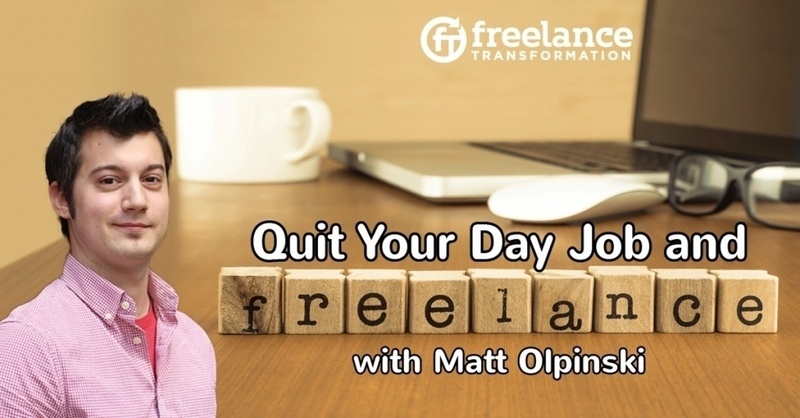 Back then, there were much fewer resources on how to freelance, and Matt didn't even call what he did freelancing. He was just working on projects with friends while he was going through school for design. However, because he started early, Matt was able to build up an enviable online presence that brings in leads without the hassle of doing outreach marketing. So how did Matt get started in freelancing? Matt was a student at the Rochester Institute of Technology studying New Media Design and Imaging to be a graphic designer. He always liked design, even if he didn't always know that “design” was the word meaning to make things work well together. When he started in college, he found a lot of on-campus opportunities to make money: working in the library, or working in the cafeteria. But Matt wanted to make money doing something related to what he was learning, he wanted to design. So he started working with his friends on small projects, fairly splitting up the work and the money. At first, the projects all came from leads in his friends' networks. But soon Matt was bringing in his own leads from class and family connections. The first project, building a website, that Matt got on his own was for a small non-profit from his home town that had invested in his education. He did the project for free to give back. Slowly, he brought in more projects such as the family's lawyer and his aunt's bakeshop. Eventually, he was presented with two giant projects at the same time from his freelancing clients. The projects were so large that he would have to work exclusively on them for 6 months. That meant he really couldn't freelance and stay at the agency. The last push was financial. Working 6 months on these projects was equivalent to a full year's salary at the agency. It made sense to leave the agency. He also decided to freelance full time for personal reasons. He wanted a different lifestyle that gave him more freedom. He also didn't see himself working at the same place for the next 40 years. That's a trend that Matt has observed in the agency world in general. Turn-over rate of designers and developers, especially the younger generations, is really high and no one stays at the same agency for more than 4 years or so. Matt suspects that most designers want a lot of the same things that freelancing offers, but they also want the security of a 9-5 job. They don't freelance because they have trouble getting leads or marketing, or they are afraid of uncertainty and doing something that isn't familiar. So Matt went out on his own as a natural progression from freelancing on the side. And the amazing thing is, he set himself up so well to get leads that he never has to do outreach marketing. Matt's strategy was to constantly keep his web presence up-to-date and active, especially his personal website, LinkedIn, and his Dribbble profile. Dribbble actually became a central strategy for Matt to get leads. There was a bit of luck here since he managed to get started during Dribbble's early days, in 2010, thanks to one of his profs. By the time Dribbble became the place for people to find design talent, Matt's profile was impressive! Check it out on Dribbble (https://dribbble.com/mattolpinski). Matt's early strategy was to post the best stuff whenever he had it and to do it consistently. And though it didn't seem to do much for him for the first 2 years, the dedication to his Dribbble profile paid off. He was recently featured on Dribbble as a success story for making $150,000 off of Dribbble leads alone in the last 3 years. But there is also some strategy to using Dribbble. The reason he took off, Matt thinks, is because he signed up for the pro-account when it was first offered. It costs $20 a year. The advantage is that there is a button on the side of his profile that says “hire me” and lets leads contact him directly off of Dribbble. He also shows up on advanced searches. Matt has become more strategic in recent years when he posts on Dribbble to make it easier for potential clients to see the scope of his work. He posts all UI/UX shots for a particular project together, rather than jumping around to different projects as he is working on them. He also always tries to make the shots look as good as he can and designs the shots to work on Dribbble. Matt's big tip is to only post projects related to the type of work you want to receive. Matt is a UI/UX guy. That means he only posts his stuff about UI/UX even though he has designed print work and topography as well. You need to send a consistent message to the people who are viewing your profile, that you are the expert in your field. Another little trick that has probably helped Matt out in search rankings is taking advantage of the name “New York”. His profile lists him in “New York”, not “Rochester, New York”. This lets him be found on searches for “New York City”, which he wouldn't have shown up on if he had listed the city and the state. Tricky! For Matt, his website was his showcase piece and his portfolio. As he learned more about design and as trends and tools changed, Matt would update his website. Matt has been redesigning and relaunching his website on a yearly basis since he started it in 2009. At first, the website served as a place to post projects in his portfolio. Some of the first posts were from those family connection projects, the family lawyer, his aunt's bakeshop, etc. As he got better and more recent projects, he would slowly replace the older ones. But then, he discovered Brennan Dunn. He took Brennan's course and read Brennan's material, and realized that he was doing something fundamentally wrong with his website. The website was focused on Matt and his work. By just presenting his work, he was essentially competing with other designers based on who had the best designs and who had more experience. With Brennan's lessons, Matt changed his positioning. Matt shifted away from focusing on himself and instead started focusing on his clients and what they need. Matt changed everything on his website to reflect this new client-focused positioning. He presented his experience and skills as tools to help the clients achieve their business goals. One of the most successful changes was to his contact form. Matt used to have a button that said “contact me” and linked to email. Now, he has a contact form that asks clients questions about their business. In general, he asks, what are you actually looking to achieve with this project? One specific question has been particularly fruitful for him: “Do you have a budget set aside for this project?” Importantly, he doesn't ask “what is your budget?” That is too forward and wouldn't get the same in-depth personal responses that he gets with “do you have a budget set aside for this project?” People tend to open up and reveal what the budget and timeline are, and what the business goals for the project are. When Matt gets the answers to the form, he follows up in 2-3 emails with detailed questions to learn more about the project. Not questions like “how many pages do you want”, but questions that focus on the business goals and how Matt can make them more money. He wants the potential client to think: “This is a person who understands me and they get it and will work with me on it. We are going to get a good result.” This is the first step in building trust with the client. A couple of weeks after launching the website with the new positioning, Matt received the answers to a form that changed how he viewed his work. The lead had written in the box under “Do you have a budget set aside for this project?” the number $15,000. That was 5 times higher than what he typically charged clients. To Matt, this meant that, first, his new positioning was working which has since lead him to continue modifying and tweaking the copy, and, second, that he was worth far more than what he was charging. Even though Matt didn't get the sale, it was eye-opening. Not all the leads from his website are great. He has seen forms where the same answer was copied and pasted into every field. He had responses to what are you business goals such as, my business goals are to have a website with this many pages, etc. He tends to give these leads one more chance to really think about the project from a business perspective by asking follow-up questions. If they still don't get it, he often says no to the project because he knows it won't be a good fit. The other strange response he tends to get is from startups who don't really know what their business goals are because they are just starting out. Matt takes the opportunity with the startups to offer business advice as well as design advice. But positioning doesn't stop at the website. Client-focused positioning is in everything that Matt does to communicate with leads and clients. Most of the time, clients who contact Matt have done their research, have seen his work somewhere, or read his articles, and know that they want to work with him. They typically use the form on Matt's website and Matt follows up and does some upfront strategy work so he can put together a realistic proposal. Before the Brennan revelation, Matt's proposals were massive 15-page legal jargon telling the client what he would and wouldn't do. Really, they were contracts, not proposals. Now, his proposals are made to align his and the client's expectations. Essentially, they outline what he has already discussed with the client in a formal way. Matt also makes sure to always include 2-3 different ways to accomplish the business goals that fall at different price points. The lowest option is cheaper for the client, meets the minimum viable product to accomplish the goals that are important to the client, but the return on investment won't be as high. The middle option matches exactly what the client's budget is and will give the client what they are asking for. Then there is the highest option which costs more, but also offers to take the project to the next level and get the client a huge return. Matt believes that the multiple options helps make the client feel that they don't have to take it or leave it. It is also hard to compare between his proposal and other freelancers because he isn't giving the client just one number for comparison. His proposal is telling the client that he can be flexible in what he delivers based on how much the client is willing to invest. It helps the client focus on the results. Matt loves teaching people and sharing his experience and knowledge. He has even been an adjunt professor at the Rochester Institute of Technology. He wants to extend the teaching through productized consulting and writing. He recently wrote an ebook, “Kickstart Your Freelancing Career”, writes a blog and newsletter, and offers email courses about freelancing. Check out his website to learn more and sign up for his newsletter.